March 25, 1911 was a Saturday—a beautiful day. Everyone who worked at the Triangle Shirtwaist Factory, in New York City, was looking forward to Sunday—their only day off. Some of the girls were singing, and quitting time was not far off. Then ... they saw flames in their workplace. Someone had carelessly started a fire on the 8th floor. It didn't take long before a firestorm traveled to the floors above. The 9th floor became the scene of a disaster. Fire escapes were not designed for so many fleeing people. Doors, locked from the outside in—to keep union agitators from entering, or for whatever other reasons—caused many workers to be trapped inside a worsening inferno. On the streets below, people were horrified as they looked up. The highest ladder, which the fire department had available, only reached the 6th floor. A reporter on the scene described what he saw and heard. The worst part, he observed, was the "thud" of a human being dropping to the sidewalk. There were about 62 such fatal "thuds" before the fire was over. In all, 146 workers were killed: 23 young men; 123 young women. The people of New York City were outraged and grief-stricken, with thousands attending the funerals and memorial processions. The owners of the factory were tried—and aquitted—for manslaughter. 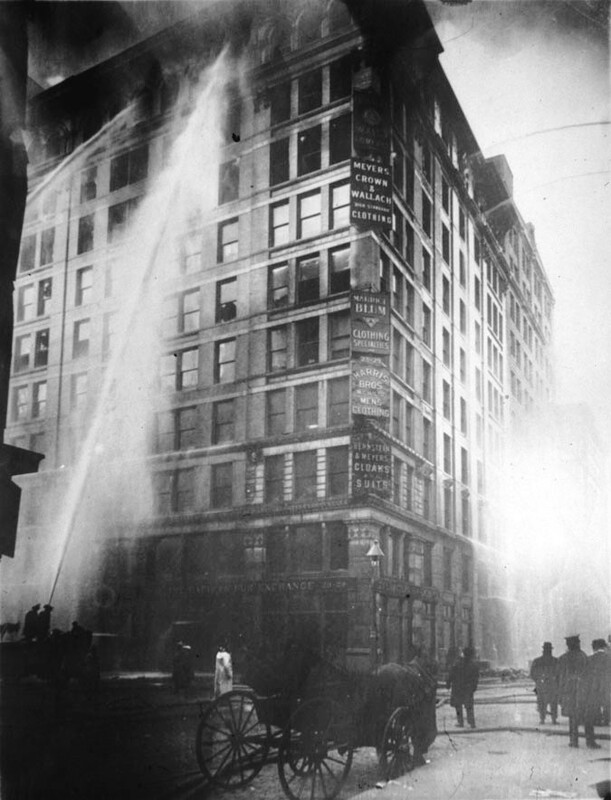 Yet ... the impact of the fire was significant, since laws were changed to protect the workers who labored in places like the Triangle Shirtwaist Factory. "The Triangle Shirtwaist Factory Disaster," from Teachers Domain, vtl07_vid_triangle—online, courtesy Teachers Domain and YouTube. The Triangle Shirtwaist Factory, 2008, by JTN Productions, WETA, and David Grubin Productions, Inc., in association with Thirteen/WNET New York. Copyright, JTN Productions, WETA and David Grubin Productions, Inc., All Rights Reserved. Bos, Carole "Triangle Shirtwaist Fire" AwesomeStories.com. Jun 12, 2013. Apr 24, 2019.